If you want to focus more efficiently and effectively – then I invite you to think inside the box. ‘Think outside the box’; ‘blue-sky thinking’; or most recently overheard and current least favourite ‘let’s popcorn some ideas’. I’m decidedly allergic to these phrases – seeing them as clichéd nonsense. However, when I jump on my judgemental high horse (as I just did) I have learnt to ask myself what that says about me. Having got off my high horse, my reflection is this: expanding my thinking, generating ideas, coming up with a mass of options and interconnected ideas – this is not my personal challenge. My challenge is to filter my thoughts and options in such a way that I am able to move forward with more focus, certainty and energy. What do I currently have? Answer the questions and populate the relevant box. Review and consider what fresh thinking and ways forward have emerged. In light of this, what do you choose to do now? Without fail I find this brings more clarity, more focus and often an unexpected, yet grounded way forward. This tool gets you to think about your challenges and opportunities in light of what you already want and have, which in the pursuit of new or different is all too easy to ignore. 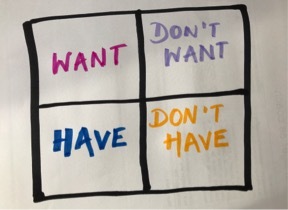 Considering what you don’t have and don’t want also brings fresh thinking. The beauty of the 4-box model is its simplicity, which is equal to the clarity of the outcome it delivers. It may seem absurdly simple but I find much of the most effective coaching is. You have all the answers, this coaching tool is just one of many ways to facilitate you finding them. If you prefer to do your thinking with a supportive, challenging listener then do get in touch. I invite you to have a go and think inside the box. I’d love to hear how you get on.